The Lovefilm instant streaming app is now available for the first Xbox One owners to download from the console's App Marketplace. The Amazon-owned on demand portal was listed as one of the few big name entertainment apps that would be made available on day one, and duly arrived on Friday afternoon as buyers unboxed. Naturally the app, which joins rival service Netflix on the new Xbox One, features 1080p streaming and Dolby 5.1 sound along with the full catalogue of movies and TV shows. It also plays nice with the Xbox One's 'snap and full' features, allowing users to work in other apps while watching content on the big screen. The Lovefilm app also features the Amazon WhisperSync technology (borrowed from the Kindle range) which lets viewers pause and resume on other devices without losing their position. It is also compatible with Kinect gestures with browsing, selecting and moving through content available through a simple wave of the hand. 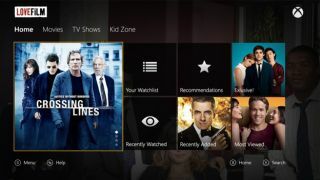 The arrival of Lovefilm boosts the Xbox One's launch line up with currently lacks Xbox 360 mainstays like the BBC iPlayer, Sky Go and Sky's Now TV. The BBC says it is working with Microsoft to bring the iPlayer to the Xbox One, which Sky says Now TV won't arrive until next summer, with no immediate plans for Sky Go. The iPlayer on the other hand will be a launch app on the PS4 when it arrives next week. It appears to the naked eye that the Beeb's beef is with Microsoft's desire to put everything behind the Xbox Live paywall.